May you be magnified, O Lord, by the revered memory of your Saints Cosmas and Damian, for with providence beyond words you have conferred on them everlasting glory, and on us, your unfailing help. Through our Lord Jesus Christ, your Son, who lives and reigns with you in the unity of the Holy Spirit, one God, for ever and ever. The only thing we know about Sts. Cosmas and Damian is that they suffered martyrdom in Syria during the Roman persecution of Diocletian, around 303 A.D. Tradition says they were twin brothers and medical doctors, and have been honored since the 6th century. These brothers never charged a fee for their medical services. Their names are in the Roman Canon of the Mass. This feast is highly celebrated in Italian communities. According to the 1962 Missal of Bl. John XXIII the Extraordinary Form of the Roman Rite, today is the feast of Sts. Cyprian and Justina. They were Christians of Antioch who suffered martyrdom during the persecution of Diocletian at Nicomedia. It is also the feast of Sts. Isaac Jogues, John de Brebeuf and Companions, Martyrs (USA). Their feast in the Ordinary Form of the Roman Rite is celebrated on October 19. This is one of the most ancient feasts of the Church, and these two martyrs have been honored in the East and West in many ways, including the building of churches in their honor in Rome and Constantinople. Along with St. Luke, they are the patron saints of doctors. Little is known of their true history, but the legend that has come down to us is of very early origin. Sts. Cosmas and Damian were venerated in the East as the "moneyless ones" because they practiced medicine gratis. According to the legend, they were twin brothers, born in Arabia, who studied in Syria and became skilled physicians. They were supposed to have lived on the Bay of Alexandretta in Cilicia, in what is now Turkey. Since they were prominent Christians, they were among the first arrested when the great persecution under Diocletian began. Lysias, the governor of Cilicia, ordered their arrest, and they were beheaded. Their bodies, it was said, were carried to Syria and buried at Cyrrhus. What is certain is that they were venerated very early and became patrons of medicine, known for their miracles of healing. The Emperor Justinian was cured by their intercession and paid special honor to the city of Cyrrhus where their relics were enshrined. 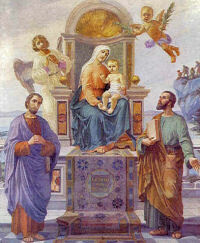 Their basilica in Rome, adorned with lovely mosaics, was dedicated in the year 530. They are named in the Roman Martyrology and in the Canon of the Mass, testifying to the antiquity of their feast day. The great honor in which they are held and the antiquity of their veneration indicate some historical memory among the early Christians who came out of the great persecutions with a new cult of Christian heroes. Cosmas and Damian were not only ideal Christians by their practice of medicine without fee, they also symbolized God's blessing upon the art of healing and that respect for every form of science, which is an important part of Christian tradition. Patron: Apothecaries; barbers; blind; chemists; druggists; hairdressers; hernias; marital harmony; midwives; physicians; pharmacists; relief from pestilence; surgeons; Gaeta, Italy. Symbols: A phial; phials and jars; vases; arrows; surgical instruments; lancet; red vestments; box of ointment; rod of Aesculapius (rod with serpent wrapped around, symbol of medicine); cylinder; stake and fagots; arrows; cross; swords; millstones. Contemplate how these brothers imitated Christ by healing the WHOLE person, both body and soul. A Christian is generous: with his time, with his talents, with his money. Sts. Cosmas and Damian practiced medicine free, looking upon this as a Christian service to others. I may not be able to imitate them in this, but my own spirit of generosity should be a clear part of my Christian witness. Pray for those in the medical field. Find out more about the miracles attached to the relics of Cosmas and Damian. If you are close to Cambridge, MA drop in on the annual Italian festival of the healing of Saints Cosmas and Damian which has been held for the past 77 years in September. Cyprian and Justina, Christians of Antioch were martyred at Nicomedia, September 26, 304 during the persecution of Decius. Already in the same century, quite a colorful legend arose about them. The legend says that at the beginning of St. Cyprian's life he was anything but saintly. Much of his early training had taken place in North African Carthage, in modern Tunisia. He had been one of the leading sorcerers of the ancient world; he was a model and guide for many in the arts of darkness, and had ensnared many souls for evil. One time, as he was attempting by demonic means to seduce a young Christian virgin, Justina, on behalf of a lustful youth, Aglaidas, which backfired. St. Justina in her simplicity traced on herself the symbol of the Cross, at which the evil spirit fled. Cyprian's pride was stung. After many other unsuccessful attempts, Cyprian recognized the power of Christ and His Gospel. He not only renounced his old ways and was baptized, but soon thereafter became a deacon, then a priest, and finally a bishop. Read this detailed account of the life and sufferings of these martyrs at the Orthodox Christian Information Center.